Cute little buddy and smart too! That child is WAY behind the times. Doesn’t he know that by the time he grows up, we’ll all have self-driving (and crashing) Teslas? Our founding ancestors taught us how to change things, and it is not through lawsuits in the admiralty court or giving consent through the vote. Try gun powder, lead, and hemp rope, you puke. I know right? I wonder what dang rock that crawled from under? Hey Mom (Dad) wheres the auto crash button? Remarkable similarity, but some will still miss the point, Im afraid. It just goes to show what programming for years can do, turn us into kids, or Tesla self-driving wannabes. The Soviets had mandatory voting, even tho there was only one choice. The U.S. tricks people thru the media to make us think we really have a choice, but the Banksters own all the ‘candidates.’ How? The media and the bankrolling and the blackmail powers they have. If you want to run for Congress you must go to NR-Israel (ie Not Really Israel), put on a yarmulke, go to the so-called Wailing Wall, and stuff papers in it. 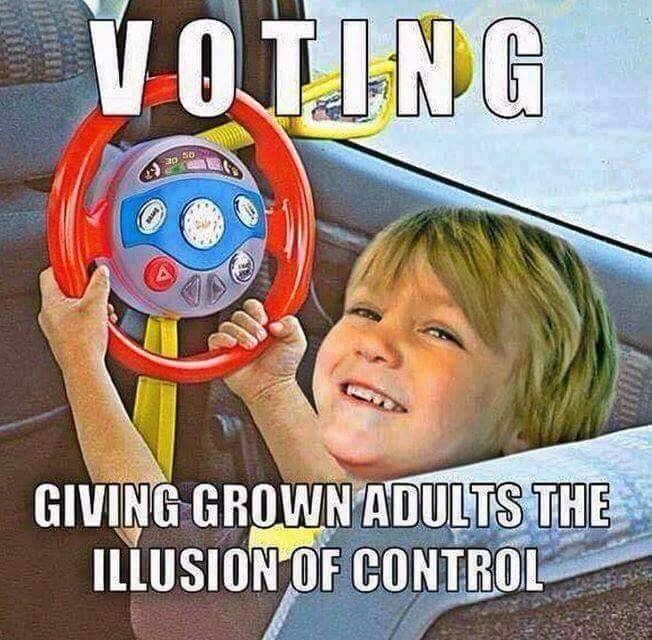 If everyone refused to vote, and stayed home, the Satanists who run this planet would panic. They want us to buy in to our persecutors. People don’t want to admit to themselves or others that they made a mistake in voting for someone, so we just keep making more and more excuses for the horrible things our leaders say and do.